After having met our English speaking driver at the cruise terminal of La Spezia port, sit back and enjoy your drive through the Tuscan countryside towards Florence on a comfortable Mercedes-Benz . Driving up the beautiful Viale dei Colli, we reach the marvellous terrace called Piazzale Michelangelo (named after the artist who sculpted the original David statue). Here you get the most impressive view of the city. Nearby you can also see the white and green marble façade of the S. Miniato al Monte church – one of the purest examples of the Florentine Romanesque style. Next we head for the city center, to the Piazza della Repubblica, surrounded by the historical literary cafés, where long ago important intellectuals gathered together. Following the Via De’Calzaiuoli, which connects Piazza del Duomo (S. Maria del Fiore, the Baptistery, Giotto’s Bell tower) to Piazza Signoria ( Palazzo Vecchio, Uffizi , etc.) you will be able to admire the best masterpieces of Renaissance art, breathing in the magical atmosphere that only Florence can offer. 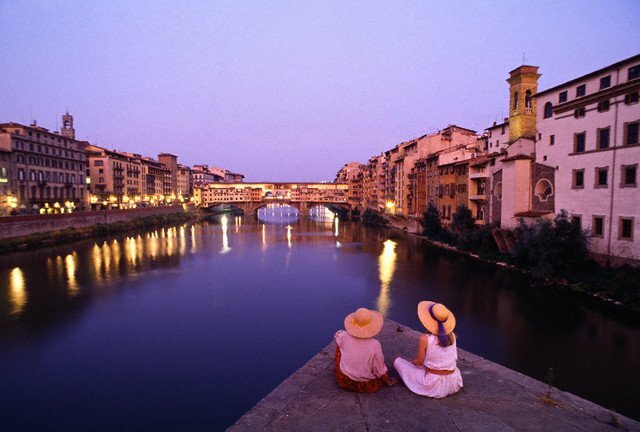 Our driver, completely at your disposition, will be more than happy to take you to Piazza Santa Croce to visit the exterior of the church, where many famous Italians artists are buried, and then take a must-deserved rest, or go to the elegant Ponte Vecchio…. For the shopping lovers or the hungry soul, there are also many shops and “trattoria” to dive into, so everyone in the group can satisfy their desires whether it be a smart leather jacket, or a scrumptious plate of pasta! Few cities of comparable size can boast such a profusion and variety of high quality goods with Italian design. The most important street for shopping is Via De’ Tornabuoni with designer boutiques like Prada, Gucci, Armani, Ferragamo, Valentino, Vuitton, Damiani, Cartier, Trussardi, Eleuteri, Buccellati, Coveri, Versace, Tiffany, YSL, Zegna, Desmo, Chopard, Tod’s, Cavalli etc. You can also see what the local craftsmen have to offer in the small local workshops or practice your bargaining skills at the San Lorenzo outdoor market. In the afternoon, you will leave Florence and enjoy the 50 minute drive to the university town of Pisa where you will have a brief stop by the Field of Miracles for photographs and to marvel at the exterior of the Campanile, better known as the Leaning Tower. This famous Bell Tower leans over 16 feet out of perpendicular! Efforts to stabilize the building are made constantly together with a continued monitoring process of the structure. 1.If you want to visit the Accademia or Uffizi musuem in Florence is highly recommended to reserve tickets and skip the line! If interested ask to our booking office how to do it. 2.Is possible to climb the Leaning Tower of Pisa but you need to reserve tickets in advance. Ask to our booking office how to do it.